Insurers say the damage caused to homes and businesses by the Kent earthquake will cost millions to repair. 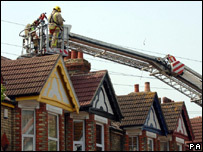 An earthquake measuring 4.3 on the Richter scale shook hundreds of homes in the Folkestone area on Saturday morning, causing chimneys and masonry to fall and cracks to appear in some properties. Malcolm Tarling, of the Association of British Insurers, said his members were ready to respond. "The last serious earthquake that struck Britain in Dudley resulted in a bill of around £15-20 million, so I would estimate that in Folkestone it would run into single figure millions, possibly low tens of millions," he said. "But it is not something that would be considered a big deal by insurers as it is exactly the kind of event that they would have planned for. "We have had past experiences in this country of bad weather causing widespread damage, more recently the tornado which struck in Kensal Rise in north west London. "Earthquakes are considered a natural disaster but so are floods and storms, so people should not be worried about not being covered by their insurance policies." Damage caused to cars and other vehicles would also be covered by any comprehensive motor insurance. An ABI spokeswoman said that those needing to make claims as a result of the earthquake should first contact their individual insurer for advice. They should also take measures to stop further damage, she said. "If their window is smashed, for instance, they should arrange to get it boarded up to prevent it from getting worse." She added: "If they have to pay for anything they should try to keep the receipts, as these will form part of their claim."